Last Term, Year 9 attended a Raising Aspirations Day at UWE which gave students an opportunity to explore the worlds of work and study. The team representing the Civil Service at the event were so impressed by two of our students - Gideon Wilson and Tom Gilbert, both of 9ID, that they wrote to the boys personally to congratulate them on their engagement and intelligence. Well done both on making such a positive impression. Sigma House Disco - Friday 22 March at 5-7pm. Year 7 and 8 Disco tickets are now on sale for £3 and are available on Wise Pay or from Mrs Arnold. All money raised will be split between the four house charities. There are a range of books going for free at the school library! Click here for more information. Cotham School are currently recruiting new members of staff to work with us at the school. We are currently looking to hire an Admin Support Officer and a Senior Administrative Officer to join us in our main school office. We are also looking to recruit a Teacher of Maths and an English Faculty Leader. For more information about the roles please click here. Year 9 exams take place in the weeks commencing Monday 18 March and 25 March. Click here to view the Exam Timetable. Science revision will run after school in the lead up to the Year 9 Science exam. Come up to the Science office and you will be shown which room to go to. A reminder that revision guides and workbooks are available on wisepay for students yet to buy them. The next Year 10 Science mock is the Chemistry paper 1 (units C1 - C7) on Thursday 21 March. Students should now start preparing for this. All students who achieved a Grade 5 or higher on the physics mock exam will sit a Higher paper. All students who achieved up to grade 4 will sit a Foundation paper. NB: Guidance from the exam board AQA is that students must show that they are working at a strong Grade 5 before they should sit a Higher paper. Final GCSE entries will not be made until this time next year so there is time for students to gain confidence, exam technique etc before a final decision is made on exam entry tier in Year 11. Science revision will run after school in the lead up to the next y10 science mock exam (21 March). Come up to the science office and you will be shown which room to go to. A one week long work placement within a local Civil Service department, this might include for example; the Home Office, the Department for Work and Pensions or HMRC depending on your location. Defence Statistics provide a range of statistical, economic, analytical, planning and consultancy services for the Ministry of Defence (MOD). The areas covered include military and civilian personnel, finance, logistics, equipment procurement, health of the Armed Forces, health and safety incidents, surveys of MOD personnel, and all National and Official Statistics on Defence. Well done to all our GCSE Food Technology students, who spent Wednesday and Thursday completing their practical exam. The talent and skill of our young cooks was on full display and some truly impressive final menus were produced. Well done to all those involved. The final GCSE exam is due to take place on Wednesday 19 June. However, the Joint Council for Qualifications have stipulated that all students must be available to sit exams until Wednesday 26th June. This is to ensure that any GCSE exams which may have to be cancelled as a result of a national emergency or disaster can be rescheduled. Please bear this date in mind if you are planning on booking a holiday for your child or your family. Students taking examinations in Design and Technology will also need colour pencils. Off the Record will be back in school on Monday 18 March too see the A side tutor groups for more ‘Resilience Lab’ workshops. Students will be learning how to identify negative thinking traps, build resilience and when to reach out for support. We hope our students will find these sessions beneficial. The UCAS convention for the year 12s was a great success, students were able to talk to representatives from a number of Universities and Apprenticeship Placements to gather information to help when planning their futures. Resilience Workshop run by Off the Record on Wednesday 20 March 11.05am - 12.30pm. This will be a brilliant session and has already been very well received in main school. Please ask your son/daughter to see Mrs Kempt for more info. The Oxbridge trip is on Tuesday 19 March. If your son/daughter would like to attend please ask them to see Mrs Kempt. If you have paid on WISEPAY please ensure that you have submitted the consent form by Monday 18 March. Year 12 Parents Evening is at RGS on 28 March 4.30 - 7pm. Please ensure that your son/daughter has made appointments with their teachers. The Academic Mentors, Careers Advisers and Student Services Leaders will also be present all evening should you wish to see them. A reminder that there is a school counsellor available along with a Post 16 Reflection Room and many self help books available - please see Mrs Kempt. Our House assembly focused on National Careers Week. We were very lucky to have Correll Johnson, Production Technician Assistant and Darrel Lambert, Junior Production Coordinator from Icon Films who are an award-winning production company. From Animal Planet US’ highest-ever rating series, River Monsters, to Emmy-nominated actor (Charles Dance) narrated Savage Kingdom, for National Geographic, they deliver high-end factual content for the UK and international market. We were shown a short film of what they worked on and then we had a Q&A from the Prefects, Louis, Aineias and Paulo. Questions varied from what skills and qualifications they needed, what they enjoyed about their job and what advice would you give to young people who do not know what they want to do when they finish their education. A huge thank you to Correll and Darrel for giving up their time to come in and share their experiences with Sigma. The students really enjoyed it. We celebrated the success of our Charity Swimathon. Team Cotham Oscar de Havilland, Max West, Rufus Buchan, Jonathan Roche, Harry Giles, Liang Hu and Zuheib Said Obsi swam an incredible 462 lengths between them and raised an amazing £280 for The Rainbow Centre for Children. Well done team Cotham you were amazing! Thank you to everyone who supported this event. We have received a lovely thank you letter from the Rainbow Centre for Children can be read here. We had our very first Head of House award, this award was proudly presented to Moneeb Khalil 8BAK for Diligence and for being a fantastic Sigma Student. Great listening skills, working on task, polite, supporting others in his team. We celebrated all things Sigma and awarded our first Environmental Friendly Student award. This was awarded to Kushal Vijay 8BSA. Kushal has really taken the Sigma house role of recycling seriously and with great passion. He is supporting the Walkers Crisps campaign and the Sigma clothing drive. Sigma have signed up with Walkers to recycle any brand of crisp packet. We have a recycling box for your empty crisp packets. Please bring them to Mrs Arnold in the Food Office. Once we have 400 we will send them back to Walkers to be recycled. We are continuing with our Clothing Drive. We are collecting clothes, shoes and bags to recycle. Please drop them in to school. We will then sort them and arrange for a collection from Bristol Textile Recycling. 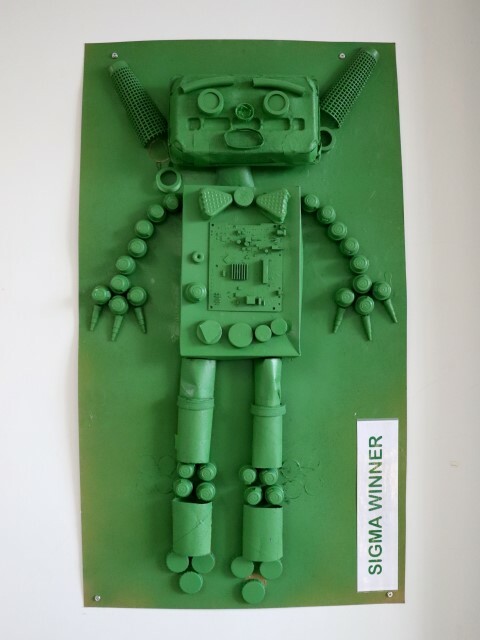 We are pleased to announce that the winning Sigma Robot is now on display in the canteen. It looks amazing all sprayed in the house colour Green! To see the Sigma Robot, please click here. Please show your support for Cotham School Sigma House Charity, The Rainbow Centre for Children, by collecting “Airbus Community Award” tokens which are featured daily in the Bristol Post Newspaper until 18 March. We are collecting votes for The Rainbow Centre for Children, a local bereavement Charity that supports children, young people and their families suffering from the loss of a parent or sibling. They are one of 30 charities hoping to gain a share of the £20,000 prize.The charity who receives the most votes will win £7,000. Please collect up your token votes and at the end of the voting period on 18 March, take them into the registered group, The Rainbow Centre, 27 Lilymead Avenue, Bristol, BS4 2BY or post them in one package along with one completed voting form to Bristol Post. (The form and address can be found in the paper with the token.) We are also collecting them into our school collection box at the Reception. Click here for more information. Votes need to be in by March 18, thank you for your support. Tickets are now on sale £3 from Wisepay and Mrs Arnold. All money raised will be split between the four houses. Click here to see the poster. Tickets will be on sale Monday 25 March in the hub. Draw to take place on Wednesday 3 April. Lots of Easter treats to win, tickets cost 20p. All cakes and cookies go on sale for 50p. All money raised for the Easter events will go to our House Charity The Rainbow Centre for Children. With this week being National Careers Week, our house assembly celebrated all things careers. We were lucky enough to have two guest speakers come into school and be grilled by the prefects on their roles, experiences and stories as to how they have got to where they are today. A huge thank you to Katie Stevens - Founder & Director, Greyhound Accountancy and Siriol Leach - Policy Adviser, Wildlife, International, Climate and Forestry Policy, Defra for giving up their time to come and share their career journey with us. The prefects did a great job in interviewing them! This week saw a flurry of new members joining the prestigious Delta 100 Club. A huge well done to the following students for reaching this impressive milestone ; Amber Ashman-Rampuri, Josie Charlesworth, Louie Chittenden, Sumaya Mohamed, Morgan Penny, Abdullah Siddique Shaon, Aisha Guled ,Harry Harvey, Gagan Kaur, Safia Abdulkaliq, Eva Bamber Payne,Mohamed Ahmed, Suad Halane, Marcos Pospori ,Adam Naseem, Ismail Hussein and Savannah Terry. We can't believe that it's already March in Gamma House, our House pride and student engagement is thriving and this was seen no more clearly then in our last House assembly. It was Careers last week and the wonderful Ms Chester invited 2 brilliant speakers into Gamma assembly to share with students their stories of how they got into their line of work. Our brilliant Gamma leadership- Soha, Rhys, Hannah and Sophie all asked probing questions to Emily Kent who is a Director at One Big Circle and Azir Razzak, Managing Director of A2ZTech. Technology is a leading industry within our city, particularly around the new and developing Temple Meads area and we therefore thought this would appeal to our Gamma students best who might not know their planned career path. Please see the other House pages on our school website to check their careers speakers. The house assembly also saw us reward our Gamma House Champion of the month. Miss Madge was especially pleased to award Esme Pykett in 9ABI. Esme is an outstanding student who is passionate about her studies and works hard in every single lesson. She is an inspiration to her peers and sets an incredible example to others. We also wanted to showcase students who have shown significant advancements in their behavior data. The following students have particularly excelled in exhibiting Cotham manners and have all received more than 5 since the start of term. First of all, I would like to announce our Omega Legend for this week, Jimmy Byrne (7KBK). Since the beginning of the year, Jimmy has demonstrated many qualities we are proud to promote in Omega House. He is a hard worker, and competitive in everything he does. His work ethic and effort in lessons is very telling as he does not have any behavior points and a huge variety of achievement points. Jimmy is polite and always willing to demonstrate positive relationships with students and staff around the school. Congratulations Jimmy! He has won a £10 gift voucher, an Omega Water Bottle, and an Omega Legend lanyard badge to wear. We recently had the opportunity to raise awareness of Careers Week by inviting some guest speakers into our Omega House Assembly. We were fortunate to have Charlene Richardson and Marlene McAllister visit from Bristol City Council. Charlene is a Senior Manager for Youth, Serious Violence and Child Exploitation and Marlene is a Youth Community Worker. Our prefects interviewed our guests about their line of work, how they got involved with the work they do and also their transition from school to work. This was an invaluable experience for our pupils to understand a little more about the world of work and how to go about deciding what they may want to do in the future. Our Omega Community initiative “Cotham Manners Golden Tickets” have provided us with our most recent golden ticket winner; Ayham Kabi (8KM). Over the past two weeks, students were instructed by their tutors to demonstrate “Humility” as the Cotham Manner. Ayham was entered into the prize draw for taking the time to help , and work with, other students in science. Ayham recognises the importance of others’ achievements and uses his knowledge without asking for anything in return. A huge well done to our Omega tutees; Bronte Carmichael-Sturrock, Elia Gerolemou, AJ Hardy and Sylvie Rose-Horne who entertained many over the past few nights with their stellar performances in The Little Shop of Horrors. I would also like to take this opportunity to highlight that next Friday, we are hosting a year 7 and year 8 disco. Tickets are £3 from Wisepay or Ms Arnold. For more information, students should speak to a Head of House or check out the posters around the school. This week was Science week. In the Science department Cotham teachers diverged slightly from the curriculum and took the opportunity to explore some of the fun and unusual aspects of the natural world. Year 7 students were using chemicals and capillary action to grow crystals as well as exploring non-Newtonian fluids by making slime. Year 8 students were exploring volcanoes, imitating a volcanic eruption in the lab as well as making fireworks. Year 9 and 10 students were working with methane rockets and Year 11 students got to put their Chemistry skills to work by making the alloy brass. Hopefully the students enjoyed science week as much as their teachers did! This week’s work of the week features four beautifully designed Day of the Dead skulls. Click here to have a look at the artwork. Congratulations to all the Year 11 students who completed their three hour practical exam for GCSE Food Preparation and Nutrition unfortunately due to exam board regulations I cannot show any pictures until November 2019. Diego Lovatt Garcia prepared squid and portioned a chicken to make battered calamari with brioche rolls, a crepe with a chicken and leek roux sauce, caramel profiteroles with vanilla cream. Esme Davies made samosa with home made pastry, chicken flatbreads served with pickled cabbage, again homemade bread, lemon meringue cupcakes with fresh lemon curd. Khadeejah Biggs made a fruit tart with creme patisserie, a haricot bean tart, aubergine pakora with fresh chutneys. Shahanaz Akhter made Chicken Biryani using her family’s recipe, she portioned chicken and used it also for her chicken shawarma, Shahanaz also made Bangladeshi egg pudding. Tegan Harris made pretzels with a chive dip, lasagne with homemade pasta, strawberry sponge cake. A further mention to the follow students, Simane Idris, Dexter Oyefeso, Ishraq Abdi, Avea Archer, Ilham Mohamed, Libby Lynn Griffiths the list of dishes made is endless. The final group are cooking today. Congratulations to all Year 11 GCSE Food students. If you're child will be 11 or 12 years old by 31 August 2019 and are interested in training with an eye to joining their club, please get in touch at colstonsparkrangers@gmail.com. Please visit www.fearless.org for more information; and for further facts and statistics click here. Information from Scottish organisations for knife crime campaigns can be found on this website.